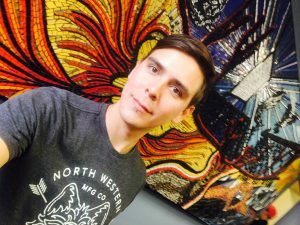 (Toronto, ONT) The #Two-Spirit Journal recently sat down with Aaron Bowerman, one of Turtle Island’s up and coming young Two-Spirit leaders. Aaron Bowerman is a Two-Spirit community leader and is currently living and working in the city of Toronto as the Regional Outreach and support service worker for the Ontario Aboriginal HIV/Aids Strategy (OAHAS). Aaron grew up on the Sheguiandah First Nation reserve on Manitoulin Island and is the eldest of 6 siblings. He is the first member of his family to engage in a post-secondary education, which led to him recently receiving a diploma from the Tourism Management – Travel Service Industries program at Humber College. Aaron has been an active volunteer throughout his adolescence oversees and in his own communities, through, Canada World Youth, 2-Spirits of the First Nation, Canadian Roots Exchange and various other community based organizations. Aaron gets his inspiration from his community ofSheguiandah First Nation and the youth that reside there and believes the only limits we have are the ones we set for ourselves.